A top notch cast of UK veteran actors have been assembled to recreate what starts off as a last criminal hurrah with a bunch of robbers with combined age of c448 years but quickly turns into a nightmare. 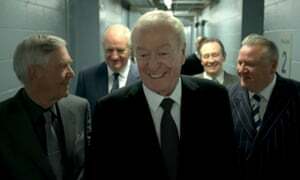 Michael Caine plays 77 year old widower Brian Reader a famous thief in his younger years. pulls together a band of misfit criminals to plot an unprecedented burglary at the Hatton Garden Safe Deposit. 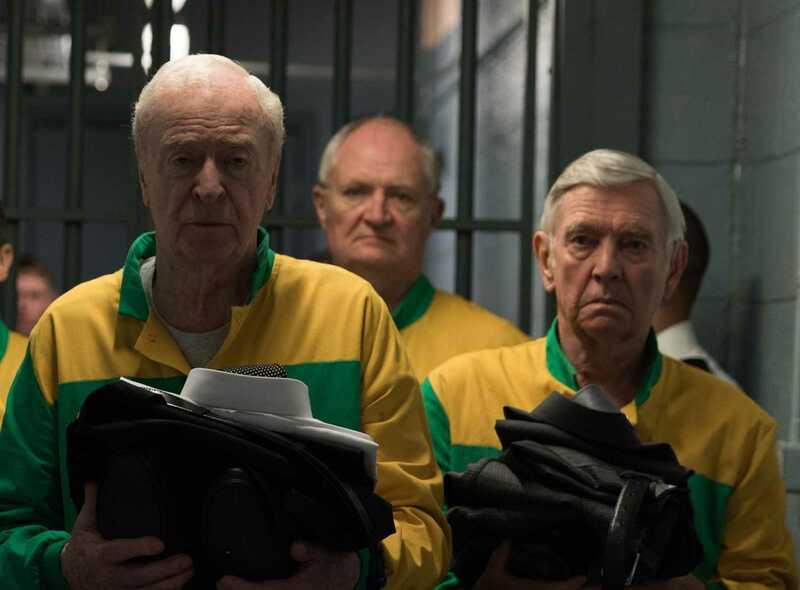 The thieves, all in their 60s and 70s except for one, employ their old-school thieving skills to plan the heist over the Easter holiday weekend. During the opening titles sequence James Marsh features a brief clip from the 1968 ‘Italian Job’ starring Michael Caine. There is also a retro shot of Michael Caine at the end of the film is also from the same film. Michael Gambon is hilarious as the weak-bladdered “Billy the Fish“. But it is Jim Broadbent that leaves the deepest impression. Far from his usual genial old gent roles in films like the “Harry Potter” series; “Paddington” and “Bridget Jones” and although he has taken darker roles e.g.”The Lady in the Van” – here he displays blistering form as a nasty piece of work. An electrifying, head-to-head unblinking confrontation between Broadbent and Caine is a high-point of the film. Snippets of past British crime movies illustrate the career exploits of the now-creaky old folks whose main preoccupations now are Crohn’s disease, incontinence, type 2 diabetes and hearing which include “The Italian Job” and “The Lavender Hill Mob. Posing as workmen, the gang entered the deposit, neutralise the alarms, and proceed to drill a hole into the wall of the safe. Two days later, they manage to escape with allegedly over £200 million worth of stolen jewels and money. When police are called to the scene and the investigation starts, the cracks between the misfit gang members begin to show as they row over how to share the goods and become increasingly distrustful of each other. The events depicted are, astonishingly, based on a true story. 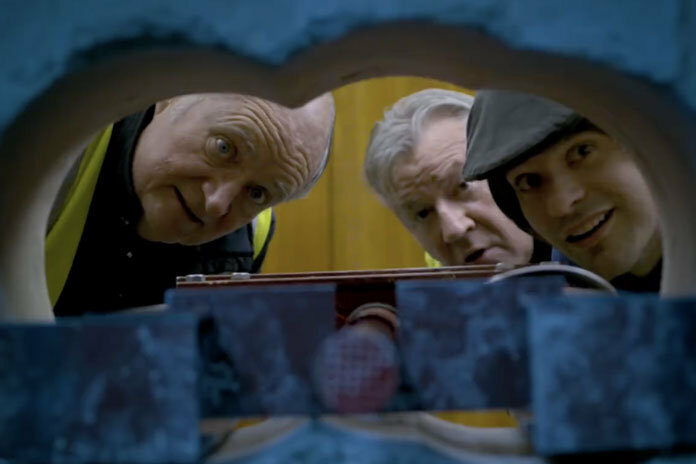 During the Easter bank holiday period April 2015, a gang of middle aged and OAP veteran criminals really did break into The Hatton Garden Safe Deposit Company in central London using the methods depicted in this film and stole somewhere between £14 million to £25 million worth of valuables from safety deposit boxes (the exact amount is unclear as customers with safety deposit boxes didn’t necessarily want to report what their boxes contained). The initial success and surprise of the robbery however was short lived as the perpetrators were caught within a matter of weeks by police after modern crime solving methods and clumsiness by the thieves themselves resulted in a string of arrests. With a script by Joe Penhall [The Road (2009) Enduring Love (2004)] and an atmospheric, jazzy soundtrack by Benjamin Wallfisch and the masterclass ensemble acting of the top class cast make the humour, treachery and robbery quality entertainment.